All Sam wants to do is to fit in at her new school. Feeling alone, and desperately trying to find her place in the world, she concocts an AMAZING story - BUT it backfires on her, and she becomes known as the 'Evil Genius's Daughter!' Can her life get any worse? 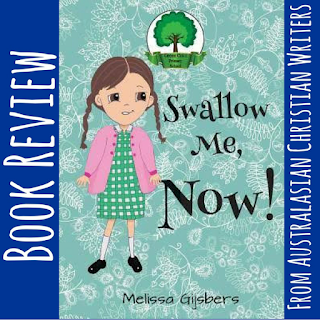 I enjoyed reading Swallow Me, NOW! and I read the whole story in one sitting. The story is easy to read and the target audience is children aged 7-12 years. Sam is in Year Five and the story starts on Sam's first day at a new primary (elementary) school in suburban Melbourne.